March was kind of a slow month for me for trading, but I did get several completed, all of which were with members of the Trading Card Database. First to arrive was with CluelessJoe, who sent along this Chucky Atkins autograph in exchange for, if you can believe it, a copy of this card. The info card was included in some NBA set- I no longer remember which one- and since he collects the Greats of the Game set extensively he had to have it. I told him I thought that it was a lopsided trade in my favor but he was happy with it. I think it's the first 2000-01 Autographics card I've added to my collection since 2003 or 2004, so I was certainly happy with the trade! The second trade was with new member Doe MG, which actually arrived the same time as the Atkins auto but I opened that one first. Doe actually has a blog, Now and Zen, which is a new blog that features the Cubs. She didn't have any basketball but sent along two baseball cards. Fine with me, any sports card I don't have before is always an acceptable trade. (most non-sport too!) 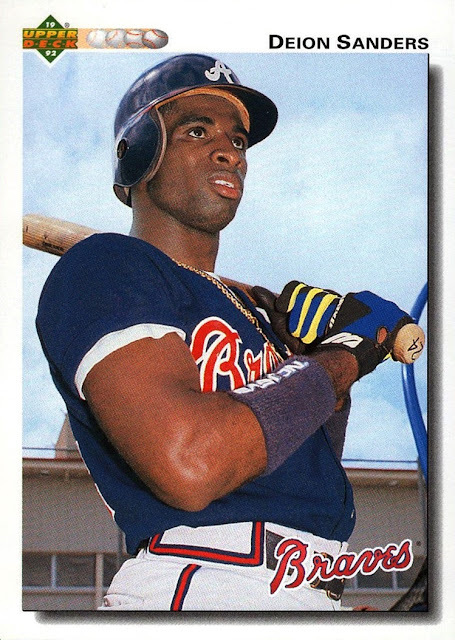 One of the cards, which I have not scanned yet, is from 1990 Topps, my all-time favorite baseball design. But since the scanner I have plugged in now doesn't deal well with the old-school brown cardstock, I scanned the 1992 Upper Deck card instead. It's only my third card from the 800 card set. My third and final trade was with Sahal694. It's not our first trade. He made a post stating that he was looking for rookie cards of three NBA players, which I happened to have two of, and was sure I had the third but I couldn't find it. I sent him off the two I could find, and a small stack of Phoenix Suns cards, and he sent me back three cards from this year's Prizm set and 13 cards from the 2017 Topps baseball set, my first time seeing them. These were my first additions to this year's Prizm set since I got a blaster on Christmas. I only scanned one of the 2017 Topps cards, as they were all done on the Database already. I scanned the one with the player wearing green and yellow, my two favorite colors. His Twitter handle is great, too. I guess that's actually the Instagram logo...I don't use that format so I am not 100% sure. 9 of the 13 cards were of people not previously in my collection, and two of them were non-player cards, so that's a pretty good blind guess he made, as I didn't tell him who was in my collection. I actually like the design in hand a lot more than I thought I would from seeing it on the blogs. No, it's not perfect, but in hand it "feels right" if that makes any sense. Overall, I took in 19 cards in trade this month, so while it was light, it was still a good month. I have a few more trades in progress but I don't think they will arrive before April does so they will count then. I almost let March slip by without posting a NASCAR Special Paint Scheme of the month. It's been a little hectic this month, to be honest, I nearly forgot. But, I will get it in before the wire! 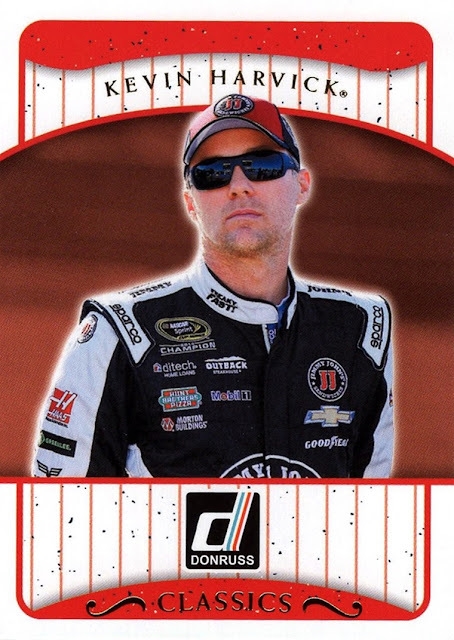 For this month's post, I will highlight a card and scheme from the new 2017 Donruss set. It features an entire subset based on special paint schemes, and I really like the concept, of course. The one I've chosen to highlight today is Ryan Blaney's #21 Wood Brothers Racing Ford, which features the Throwback scheme run at Darlington. As a bonus we also get the standard paint scheme on top (photographed at Watkins Glen, NY). 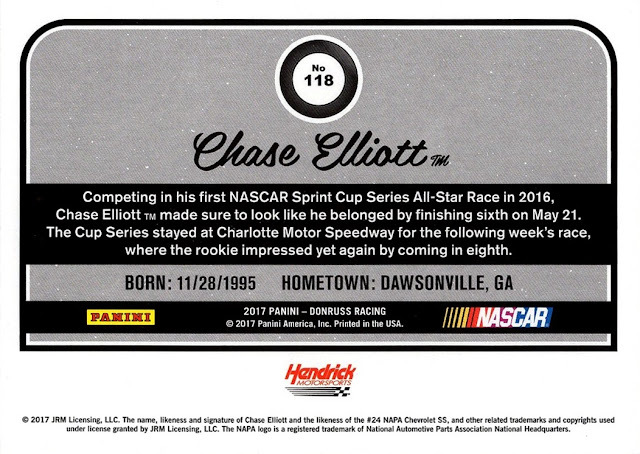 The Throwback program from Darlington is one of the best things NASCAR has done lately; 2016 was the second year of the project and they have already announced it will continue into 2017. Darlington was the first paved track to remain in NASCAR, it held it's first race in 1950, which was also the first 500 mile race in NASCAR history. 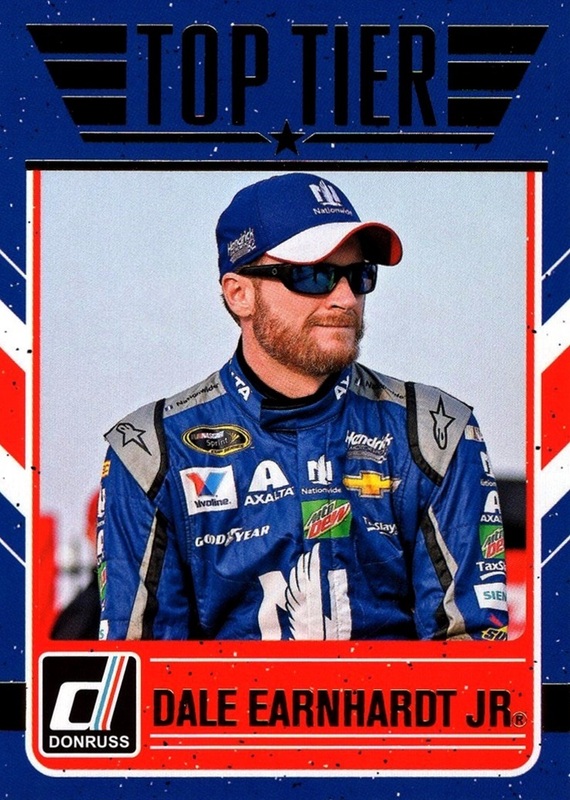 It had held the Memorial Day weekend date from 1950 to 2004, when NASCAR took the race away and gave it to California Speedway, a move that was very unpopular with fans. They gave the traditional date back to Darlington in 2015 and that's when the idea of throwback schemes was launched. 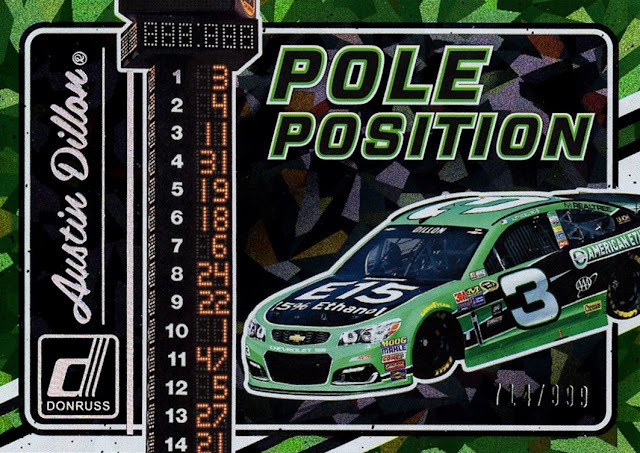 In 2016 39 of the 40 cars ran a throwback paint scheme, making it the most number of special paint schemes in a single race in NASCAR history. Only the #44 of Brian Scott, owned by Richard Petty, did not...certainly someone they could have pulled a throwback scheme to. The #21 Wood Brothers team has a great history, as the oldest team in the sport, in operation continually since 1950. The peak era of Wood Brothers dominance was the 1970s with David Pearson behind the wheel, and that's what this car harkens back to- Pearson's name is even on the door, which is where it used to be before moving to the roof in the 1980s. It's only unfortunate that Ford closed the Mercury brand down, as the original car was a Mercury. Blaney finished 13th after starting 20th in this car's only race. 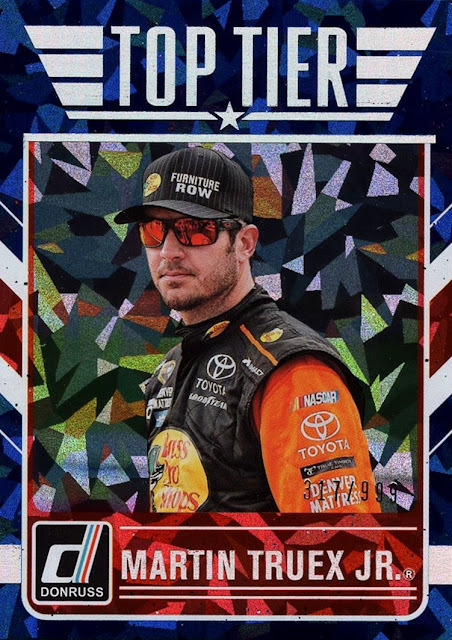 He was unable to lead a lap but a rookie not leading at Darlington, known as one of the toughest tracks on the schedule, is no surprise. This card, and its 10 parallels, are the only cards it appears on. Blaney, like the Wood Brothers, comes from a racing family. His father Dave was a long-time Cup competitor and was a champion Sprint car racer before that. Dave's brother Dale is also a successful sprint car driver and was even drafted by the Los Angeles Lakers, although he chose not to pursue an NBA career. Their father Lou was also a noted Sprint car driver/builder but I am not very knowledgeable about pre-1990s sprint racing so I am unsure of the extent of his career highlights. 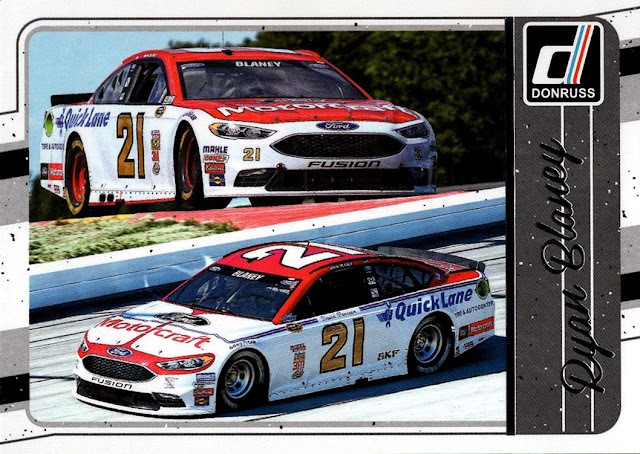 It should be noted that the standard scheme for the Wood Brothers is in itself a throwback to the 1963 Daytona 500 car, or based largely upon it. (That car had dark metallic red, instead of solid bright red, and scallops on hood and trunk). They have run this paint scheme mostly unchanged since 2011, when Trevor Bayne won the Daytona 500 in only his second start- my favorite Daytona 500, in actuality. Don't be too surprised to see one of these 2017 Donruss cards pop up in this project again! Back to one of my favorite new features, a look at ten more people who comprise my NBA collection. I wrote this post up several nights ago and pushed it back because of the NBA history I saw on Friday night, so the active players may have played another game since then- I didn't want to go in and rewrite any of it. New Zealand native Steven Adams is one of only four players in NBA history to hail from his country- three of which still have strong ties to the NBA. (One plays for the Pistons and one is GM of the Nets- all four will eventually appear in this project). Adams has currently played 299 games, all of them as a member of the Oklahoma City Thunder, who drafted him in 2013. He is a frequent target of Russell Westbrook's assists. He has played the most NBA games by a New Zealand native. 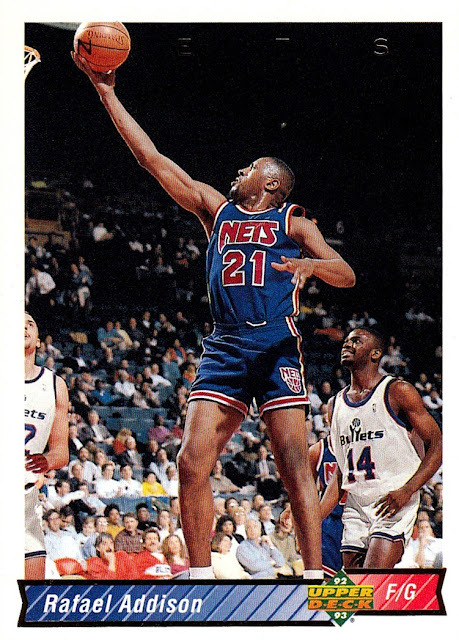 New Jersey native Rafael Addison played 379 games over 6 NBA seasons, that spanned the 1986-87 through 1996-97 seasons. He played 1986-87 with the Hawks, then spent the next 4 seasons playing in Italy. He returned to the NBA in 1991-92 and 1992-93 with the Nets before spending another year in Italy. He then came back, playing one season with the Pistons and two with the Charlotte Hornets. Although a role player he started no less than 3 games every season of his NBA career except 1995-96, when he did not start any at all. 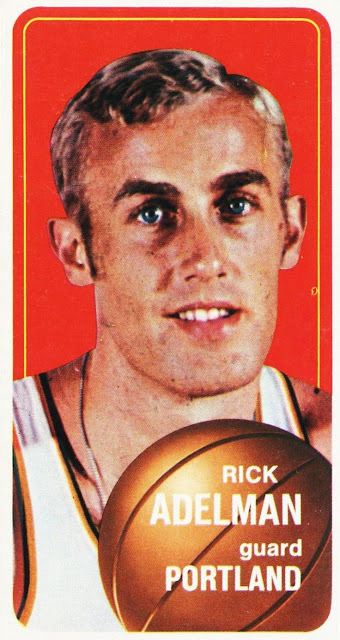 Rick Adelman had two NBA careers- as a player from 1968-69 through 1974-75, and as a coach, reaching head coach status in 1988-89 through 2013-14, when he retired from coaching. The native of Lynwood, California, played 462 games for a variety of teams over his seven year career, including 3 teams in one season, which is unusual, but not unheard of. He started with the San Diego Rockets, was taken by the Trail Blazers in their expansion draft, played a season and a half with the Chicago Bulls, then was traded to the New Orleans Jazz, who traded him to the Kansas City-Omaha Kings, where he concluded his playing career. His coaching career was much more stable. 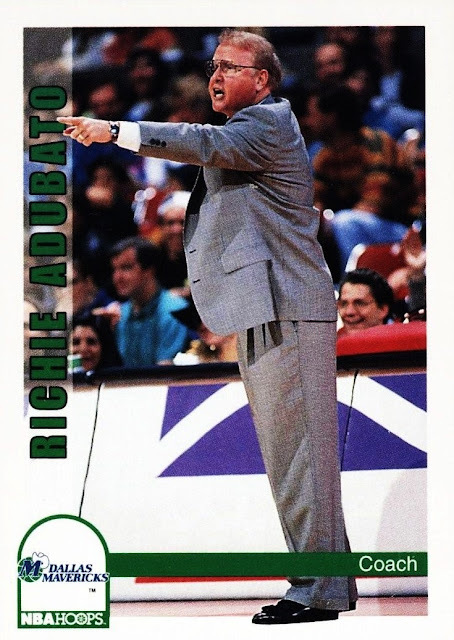 He joined the Blazers as an assistant in 1983-84 and eventually became head coach partway through 1988-89. 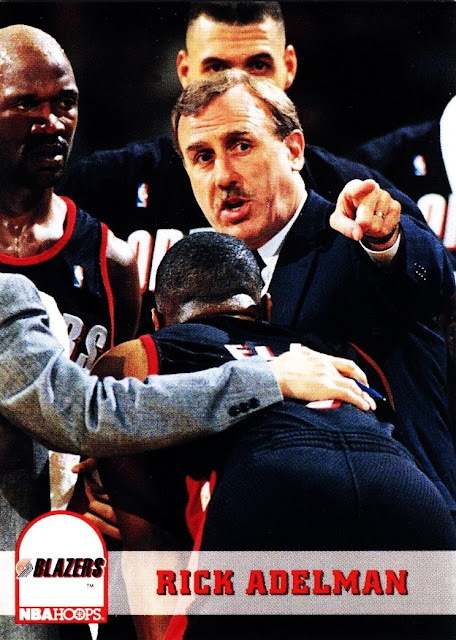 He would see his greatest success as a coach with the Blazers, and remained with them through 1993-94, including two trips to the NBA Finals in 1989-90 and 1991-92. He took a year off then joined the Golden State Warriors for 1995-96 and 1996-97. Another year off and then he rejoined the Kings organization, now in Sacramento, for 1998-99 through 2005-06. Another year off and then it was off to the Rockets, how in Houston, for four years. He concluded his coaching career in 2011-12 through 2013-14 with the Minnesota Timberwolves. 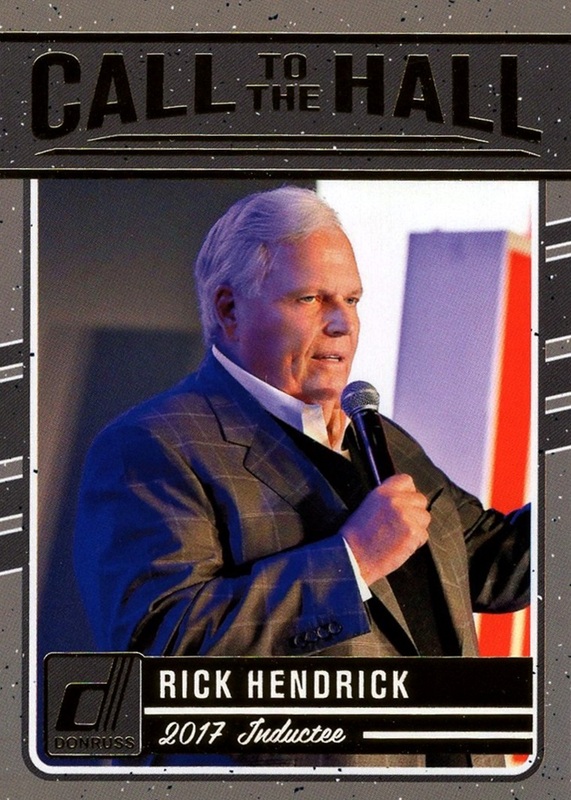 Since he has two careers, he's a bonus coaching card of him. It takes only until the 24th person to get to our first non-playing coach. Richie Adubato, of Irvington, New Jersey, spent 13 seasons as an NBA assistant coach, but assumed the head coaching job on 3 separate occasions spanning three decades. He coached the Pistons for a portion of 1979-80, the Mavericks from 1989-90 through 1992-93 and part of 1996-97 with the Orlando Magic. He also served as an assistant on the Knicks and Cavaliers. His career spanned 1978-79 through 1996-97 in total. Adubato was head coach for a total of 367 games. Currently a member of the Sacramento Kings, Los Angeles native Afflalo has currently played 704 games over 10 seasons for the Pistons, Nuggets, Magic, Trail Blazers, Nuggets (again), Knicks and Kings. 2013-14 with the Magic was statistically his best season so far. I really enjoyed watching him play for the Knicks last year and was disappointed when they chose not to offer him a new contract for this season. Maurice Ager is a player I honestly don't know too much about. 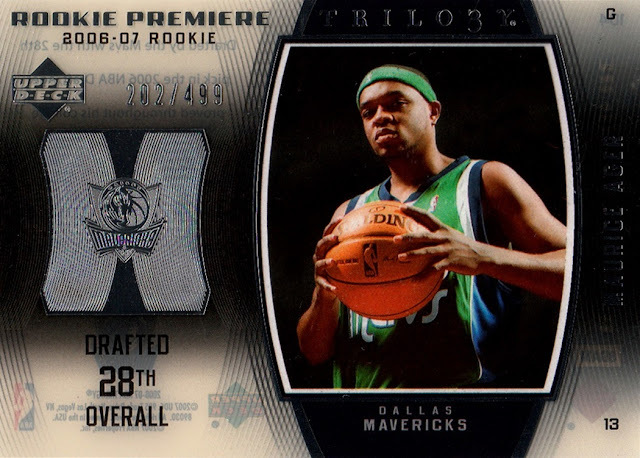 I was away from the NBA from mid-2006-07 through 2011-12 and his entire career came during that time, in fact, I did not get any cards of him until 2016. I consider leaving the NBA as I did one of the biggest mistakes of my life, but this is about the players, not me, so I shan't digress further. What I can tell you is that he is a native of Detroit and played 82 games over 4 NBA seasons for the Mavericks, Nets and Timberwolves. 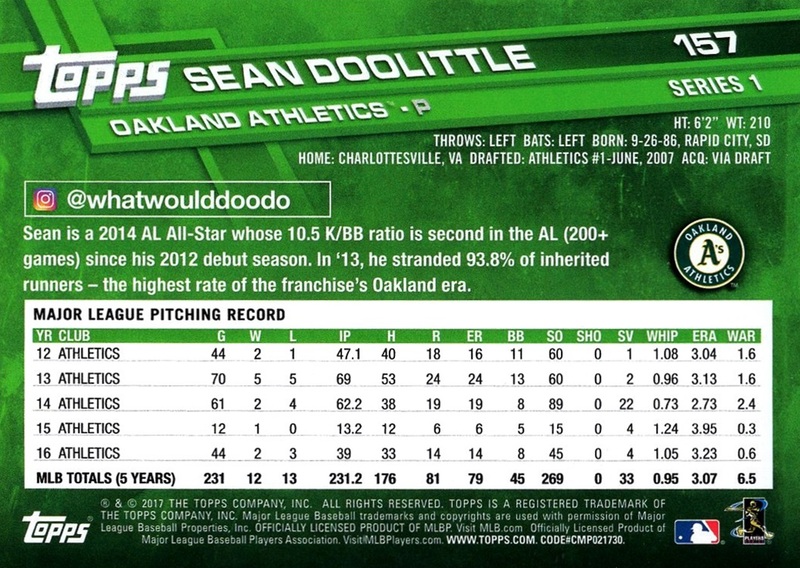 His career lasted from 2006-07 through 2010-11. He is now a musician, and also has been nominated for a Grammy Award for music production. Michigan State, where he attended college, uses one of his songs as an anthem for it's football team. Mark Aguirre, from Chicago, has been the name I most often hear when "Why is he not a Hall-of-Famer" comes up in conversion. He scored 18,458 points over 923 games across 13 seasons. 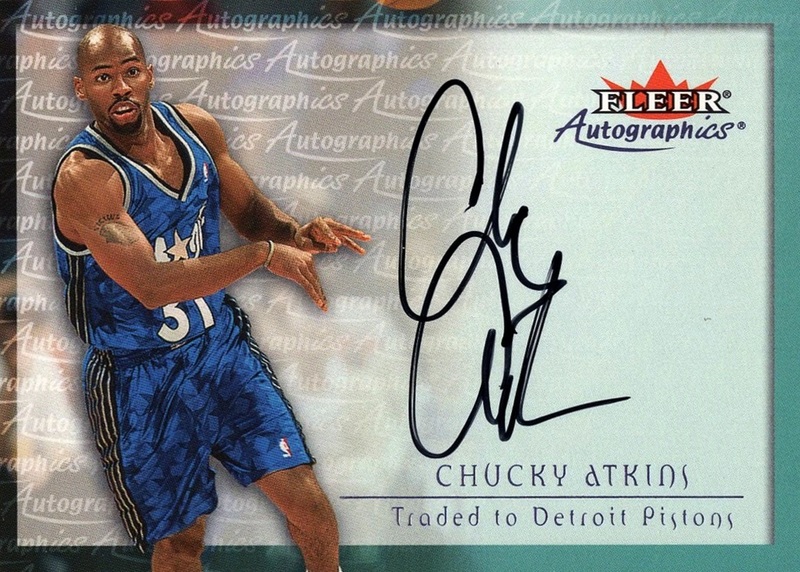 He was a three-time All-Star and was part of the "Bad Boys" Pistons back to back championships. 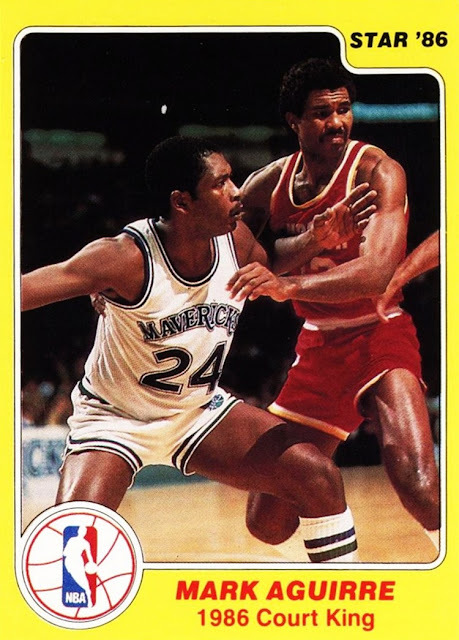 His career lasted from 1981-82 through 1993-94, with the Mavericks until 1989, and then played his final year with the Clippers. Even though he has not played for the Mavericks since 1988-89, he still ranks third all-time in points scored in franchise history. 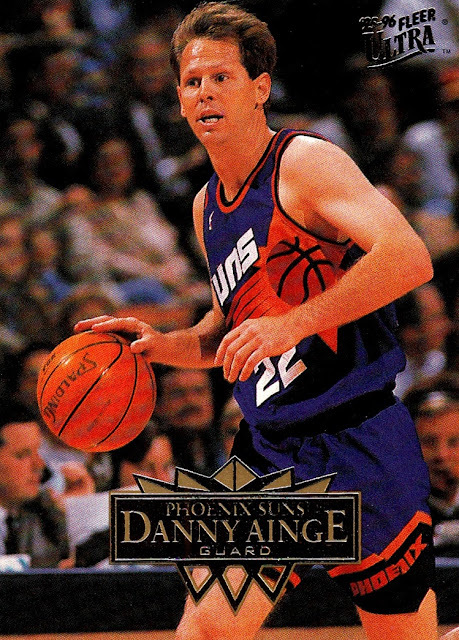 Danny Ainge has had three NBA careers- player, coach and GM. He also played professional baseball! This will focus solely on his NBA careers. The native of Eugene, Oregon played from 1981-82 through 1994-95, playing for the Celtics, Kings, Trail Blazers and Suns. The majority of his career came with the Celtics. He played 1042 games, was an All-Star in 1987-88 and led the league in 3s that same season. He also won two titles with the Celtics. He coached the Suns for 226 games from 1996-97 through 1999-00. Since 2003, he has been General Manager and President of the Celtics, assembling the team that won the NBA Championship in 2008. Currently a member of the New Orleans Pelicans. A native of Saint-Etienne, France, Ajinca has played 286 games in the NBA for the Bobcats, Mavericks, Raptors and now Pelicans. His greatest success and longest tenure has come in New Orleans, with 215 of his 286 games with the Pelicans. He returned to Europe for the 2011-12 and 2012-13 seasons. The "S" on his first name is silent. The least-well known player in this installment, the native of Konak, Turkey, played only one season in the NBA, 2014-15. He appeared in 41 games-exactly half of the season- but did manage to start 9 of them on a dismal 76ers team. 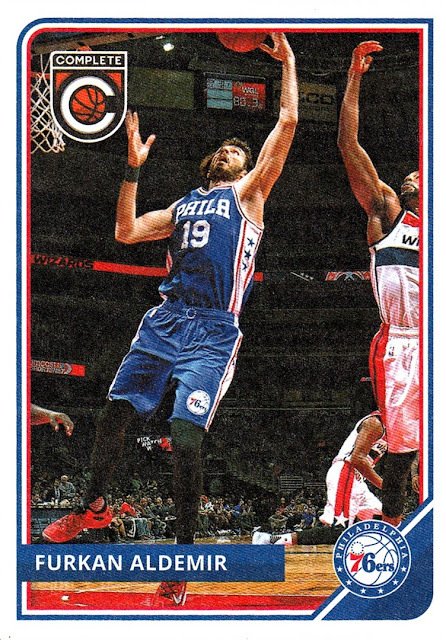 He has played professionally in Turkey since 2011, and has returned there since his stint with the Sixers. He was drafted in 2012, by the Clippers. 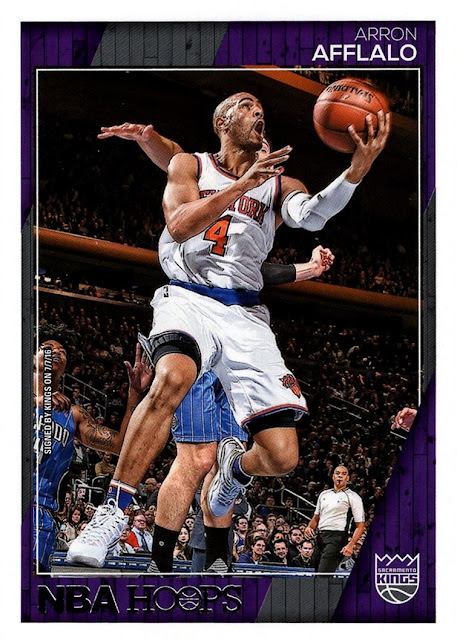 This card, and it's two parallels, are the only NBA cards he ever got. I've been watching the NBA for a little over 21 years. I've seen many great players, many great plays, many historical events. Last night set a new record. Second year player Devin Booker of the Phoenix Suns put up 70 points on the Boston Celtics. It is the most I've seen scored by a single player in a single game in my entire time watching the sport. It wasn't enough...the Celtics held on to win 130-120, but this is a pretty big deal. He becomes only the 6th player all-time to hit 70 in a game. Only the second to do so in the time I've been watching, but...I didn't get to see Kobe Bryant's 81 point night against the Raptors in 2006. I was keeping up with the scoring online, but I didn't get to see it. This one, I saw. I watched it on the repeats. I have both NBA's League Pass and the NHL's Center Ice (Thanks Ma!) and I usually watch hockey live as it doesn't repeat, and then I watch the NBA games as they repeat over night. This game happened to be the 6th game I watched all or a portion of on the 24th-25th of March. (And since the repeat went off I found a 7th game to watch- I'm writing this at 4:49 AM but I will publish it later) The great thing too, is that even though the game had been done for hours, I had no idea what was going to happen in the game. I had seen the final score, but I didn't know the details. I love the sport itself so much that I will watch games where I know the final score already. I'm sure glad I did this time! I'm not a huge fan of the Suns or Booker to be honest, but I'm still really thrilled I got to watch that game. I love to see history. This was the most ever scored against the Celtics. One of the NBA's original teams, the previous record for points scored against them was 64 by Elgin Baylor, who did it in the 1960s, long before I was born. This was the first 70 point game this decade. The NBA averages only one per decade, so it's pretty special. There have been games where the entire team scored less, I think the Mavs put up 67 earlier this season, for example, when most of their best players were out injured. Any time a player can score into the 40s is special (Many never do in their whole career) so to put up 70 in a single game is nothing short of incredible. 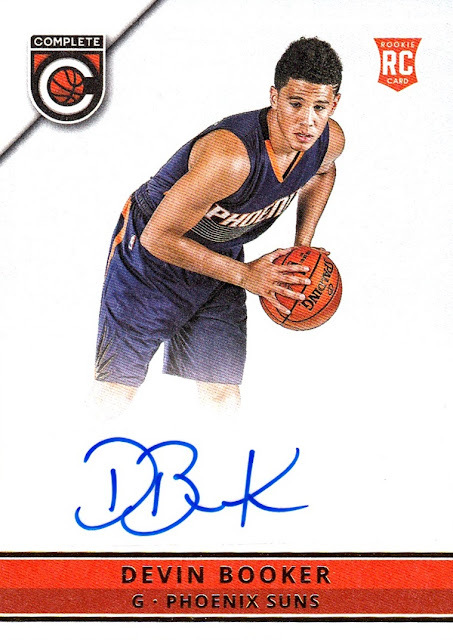 I don't have a whole lot of cards from the last two seasons, but this is, by far, my best Booker card. The autographs in the Complete set are significantly rare, but I managed to pull his; I don't think I've ever shown it on the blog before. I believe the autographs are one per case in last year's Complete, but maybe not. The math involved is more than I want to do for fun :) They fell one in every 720 packs, and there are 36 packs per box. Luckily, I still have the box I opened last year still at arm's reach away. Booker held one record that he's held since opening day of 2015-16, also. He's the first player to be born after I discovered the sport. He was born in late 1996, after the start of the 1996-97 season. I discovered the NBA late in the 1995-96 season. It's not too often I am compelled to make a post about current events, but this...seeing the most points I've ever scored in a game in my favorite sport- this was enough to do it! I already had a post planned for today, but it can wait. It's not every day you see 70. In case you are wondering, the 5 players to hit 70 before last night are: Wilt Chamberlain, Elgin Baylor, David Thompson, David Robinson, Kobe Bryant. That's in chronological order. Even Michael Jordan never did it, his career high was 63 (69 in the playoffs). Every so often a Blog Bat-A-Round will come up. Somebody poses a question and bloggers respond with a post with their answer. This is the second one I've taken part in since I began blogging in November 2014 so it's not a very common thing, but it's always interesting- I wish it was more common. This round of Blog Bat-A-Round was posed by Nachos Grande and wonders what the hardest set to complete was, and if you've succeeded. Good topic, because I consider myself a set collector first and foremost. My initial thought was 2002-03 SP Authentic, a 203 card set that includes 103 serially numbered cards and 31 of them also being autographed rookies. It was a challenge to complete the set, but I did...and not in a very long time. I completed it in 2004. which is really only a year, because SPA was always one of the later season releases. I managed to pull the Yao Ming and Manu Ginobili cards, two of the three key rookies. Normally I don't pull the biggest cards from a set so I know I can't complete them. That time I did. I also completed the set without an Ebay account, that came in 2006. So even though I consider it one of my more notable accomplishments...it wasn't hard. There are sets I've been working on for a long time. I still have not completed a lot more than I have, but I take a rather passive approach to collecting. I like to buy mixed lots and get what I can get. A large portion of my collection has come from local shops that sell full 550 count boxes of mixed cards that I love to get. When buying singles I usually just use the "low hanging fruit" method, meaning, since I like it all, I buy what's cheap and available. I don't usually actively chase cards until I get a set fairly close. The hardest one that I've completed is 1994-95 Topps Embossed. I've talked about this set before. I came up one card short on my box and chased it for many years before finally buying it on COMC last year. But that's not it either. The hardest one...that is 1988 Leesley Bigfoot. The very first set I ever added to my collection, in 1988, at 4 years old. It's only a 100 card set...but I still need 9 of them. I purchased a sealed box on Ebay and the collation is terrible. I'm 9 short, yet I have some cards where I got as many as six copies of them from the box. The cards don't come up for sale all that often, I've NEVER been able to find one as a single that I needed...in 29 years. I don't really want to buy another box- they aren't exactly cheap, although they are less than most of the current sets being released. Mostly I just don't want to end up with a box full of duplicates. I do want to complete the set. What's even rarer? 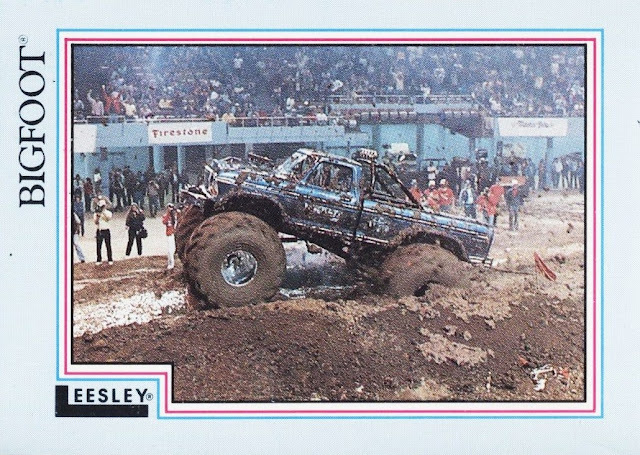 That's the 1988 or 1989 Leesley Monster Trucks set. 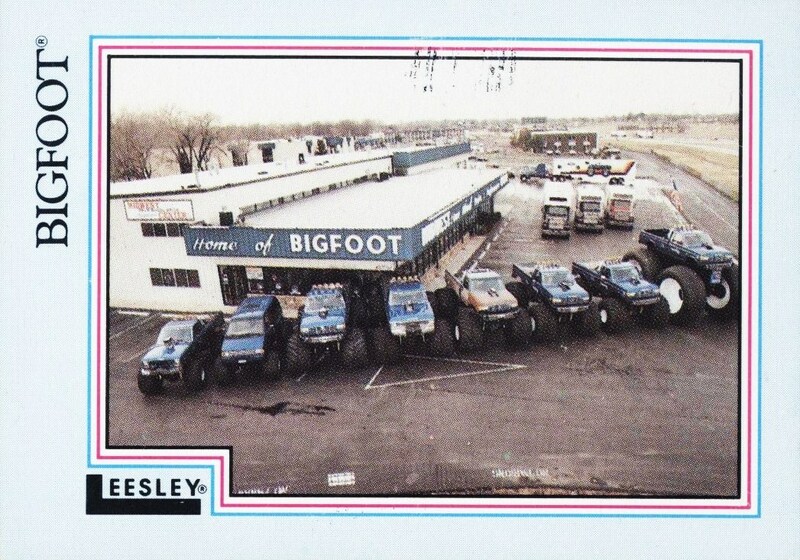 Not just Bigfoot, but other trucks as well. The gray border set. I've never seen one in person. I want to find them, but I've never found any for sale that weren't defaced (autographed). Maybe someday. 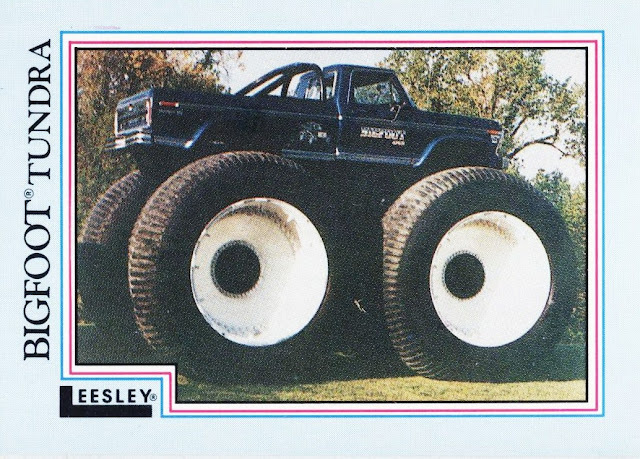 They must have been rare even when new because 1988/89 was the height of my monster truck craze and if we had ever seen them, we would have gotten them then. 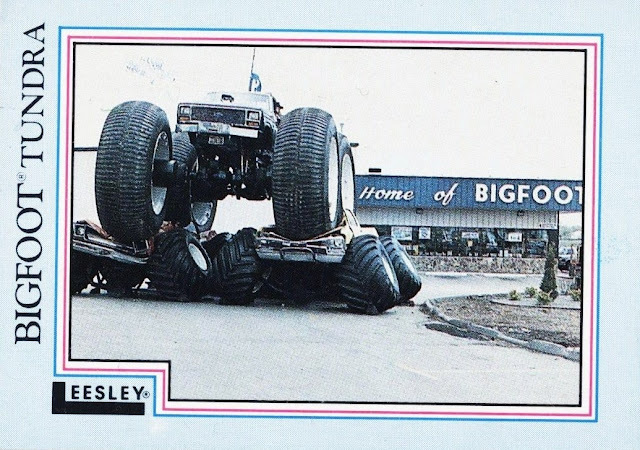 Here are some cards from the 1988 Bigfoot set. Nowadays, it causes me significant pain to see the classic cars being crushed, but when these came out, I was 4 years old and didn't think about that. I seriously considered not even posting that one showing the death of that red Oldsmobile. 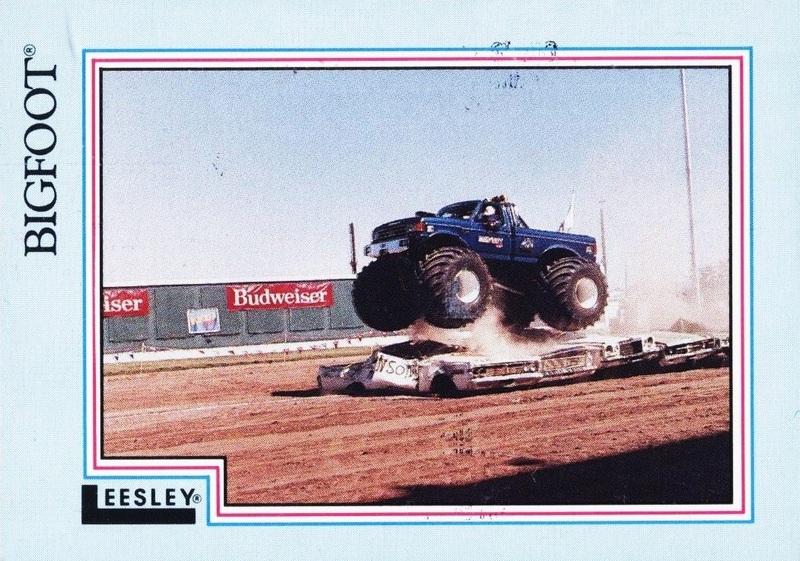 I have not watched monster trucks for many years but I still want to complete this set. I said that I wanted to pull my first NHL autograph, after buying my first NBA and NASCAR autographs as singles. That didn't happen, but it was still a surprise, which is what I really wanted it to be! And a surprise it was- I wasn't expecting a package, I had to do some sleuthing to figure out who sent it, and most surprising of all is that it did not come to my PO box address, but right to my door. After having problems with our mail being stolen right out of the mailbox we have switched to the PO box almost exclusively. In fact I didn't think any of the card people I know even had this address. So when I saw this I had no idea what it was going to be. There it is, my first NHL autograph! The kindness of my fellow card collectors, and hockey collectors in particular, never ceases to amaze me. And now that I don't have to worry about not buying my first as a single, this opens me up to start shopping on COMC...if only I had more than 42 cents in my account. Of course, if I had actually done something like buy some cards, I might have crossed this threshold sooner, but in fact I have not purchased any cards since January, all my new additions- over 1000 NHL cards alone- have come as gifts or trades. What a community! But this isn't all! The package contained 5 cards. One of them....the one that clued me in on who sent it- was this NBA card, that I had claimed on Kirk's blog a while ago and then forgot about. To be honest I had actually forgotten that I had claimed this one. My memory is really bad...bad enough that I didn't recognize the name on the return address despite this being the third or fourth time Kirk has sent me mail, LOL. 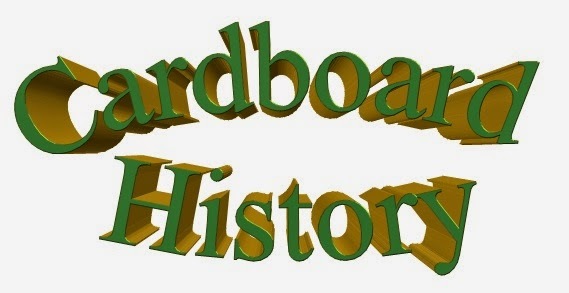 Yes it comes from my friend Kirk aka CaptKirk, who is a regular on the Trading Card Database and his own blog, as linked above. 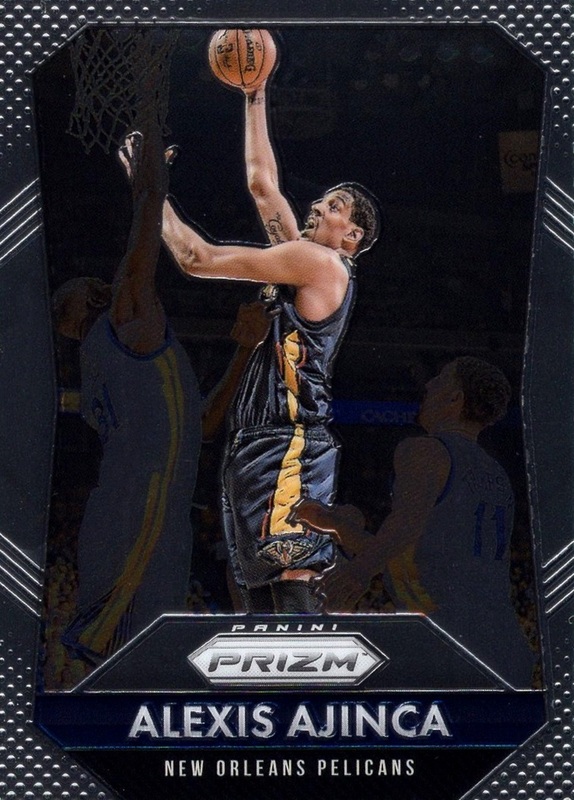 This insert comes from 2015-16 Donruss, a set I really liked. This The Rookies insert is 50 cards long and includes some guys I don't have a lot of cards of. 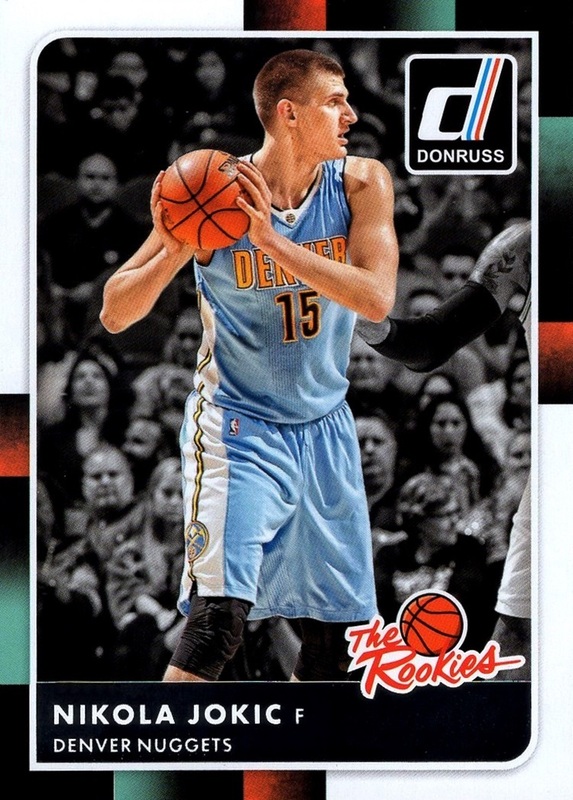 Jokic is one of them for now, but he's having a breakout season this year. Despite the fact that it's his second season he's definitely in the running for Most Improved Player this year. He's going to be the keystone the Nuggets build their team around for the foreseeable future. I think this is my 4th card of him only...maybe 5th. When I claimed it from Kirk it would have been my second. I think. I'm glad he remembered because I forgot totally until I saw it today! The final card I needed was a hologram. As you should all know by now I love holograms. I think they are the best kind of insert set in card history. I now have 3 of the 9 cards from this insert from 1991-92 Upper Deck. That's pretty good considering I just got my first in January! 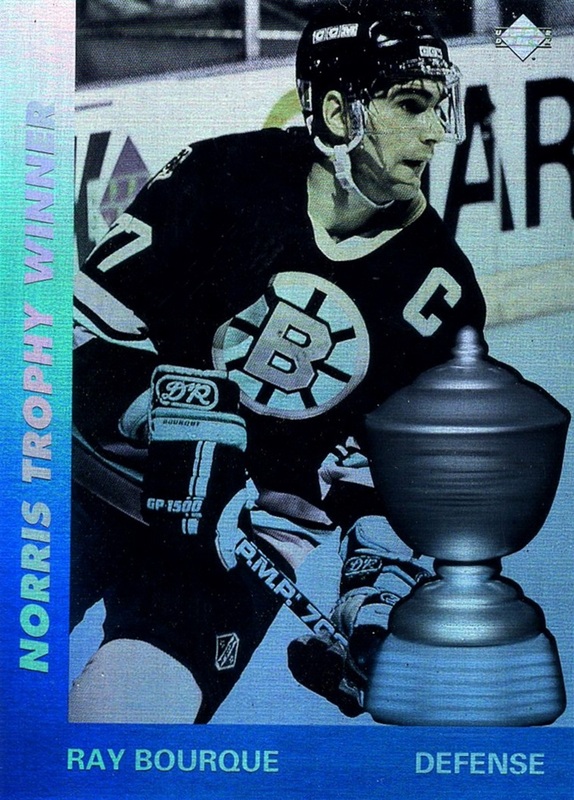 I finally completed the NBA set about 2 years ago now, but I'm finding the NHL versions scan better, and also the examples I've gotten are not as beat up as the NBA versions I have. I don't know if that is due to the life they have lived before I got them or if they were not made as well. Such a great card though. Holograms rock! The package also included two Nets cards, one from the same Donruss set and one from last year's Complete Silver parallel, but I had those already. Thanks so much Kirk, you truly surprised me with this one, in more ways than one! 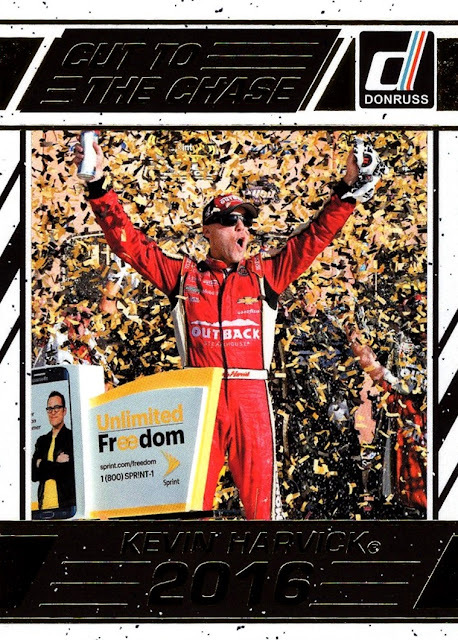 Donruss makes it's triumphant debut in NASCAR with the 2017 set, and it positions itself as the flagship NASCAR release. There's a lot to like about this set, here's my breakdown of what I got in my hobby box. My initial thoughts on the set: I'm actually surprised. The base set is 189 cards long, which is the largest set we've gotten since 2011, and most surprising is that the subset concept has returned in a big way! 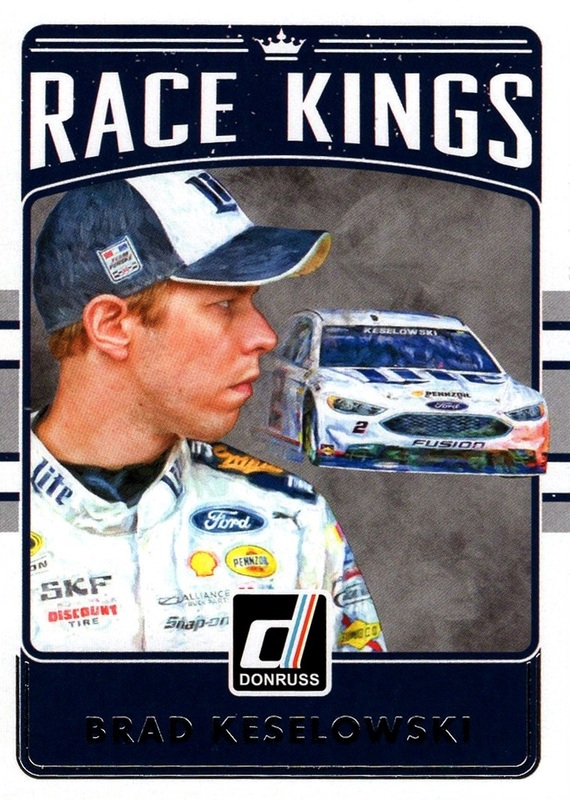 Race Kings, (and Queen, for Danica), Rated Rookie, 1984 Retro, Cup Chase, Pit Crew and Nicknames all appear as subsets in the base set. I fully expected them to be inserts, but I am glad that they were not. What I'm not glad about is the fact that most of them are short printed. I got only three of the Race Kings, 1 of the Rated Rookie, and two of the Nicknames cards. 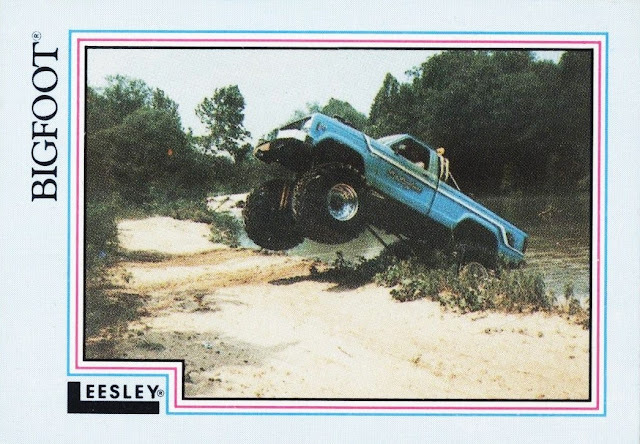 1984 Retro was almost plentiful with 6 base cards. Pit Crew and Cup Chase are not short printed and I completed both of them. I would have liked to have seen them be not so short and cut down on the duplicates. My box yielded 106 duplicates, some of the cards giving up three examples. That's almost two full base sets. Most of the Cup drivers have a driver card and a car card...but not all. And some of the choices are downright odd. 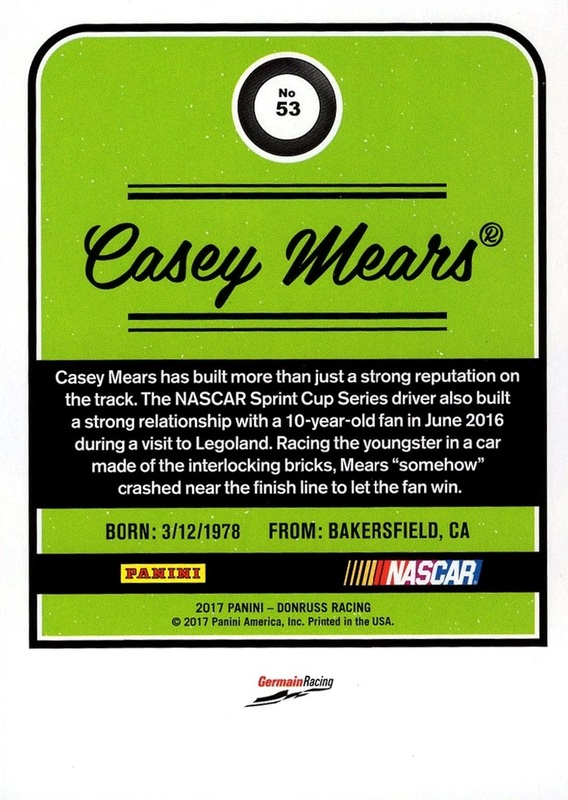 Kyle Larson does not have a base card. Carl Edwards does not have a car card. Aric Almirola is not included in the base set at all yet appears in the autograph inserts...he also has a card in the 1984 subset but that's it. The design of the base card is superb. The borders match the team colors. The backs of the cards are bright and colorful but the second most disappointing aspect of the set (with the first being the lack of car cards for everyone and the odd exclusions as mentioned above). There's a LOT of wasted space here. Some of that wasted space could have been removed and career stats included. Even just a total, not a season-by-season breakdown, would have been appreciated. We have not gotten a set with real stats since 2008, so it's desperately missing. 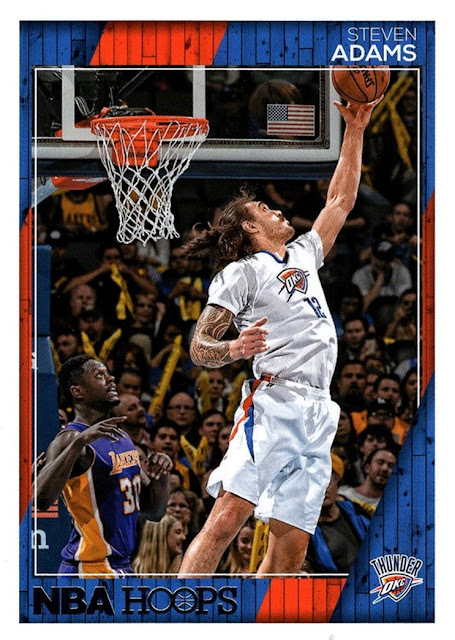 What I do like about the back is that Panini has included hometowns. This is good info and something they usually ignore on the NBA cards. The colors are bright and vibrant, which I like. Mears is the only driver who has this green color. 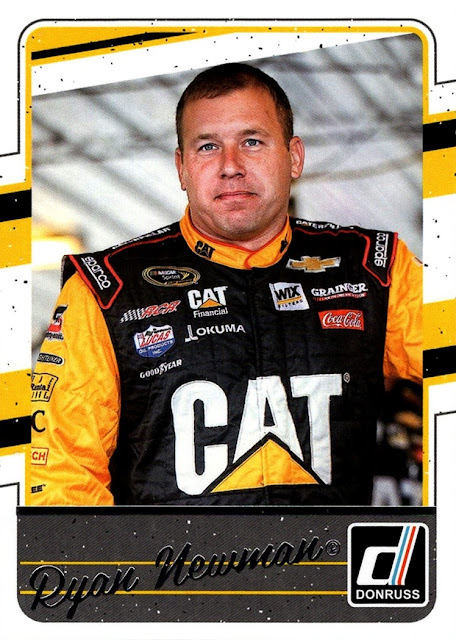 He's another driver who has a base card but no car card. 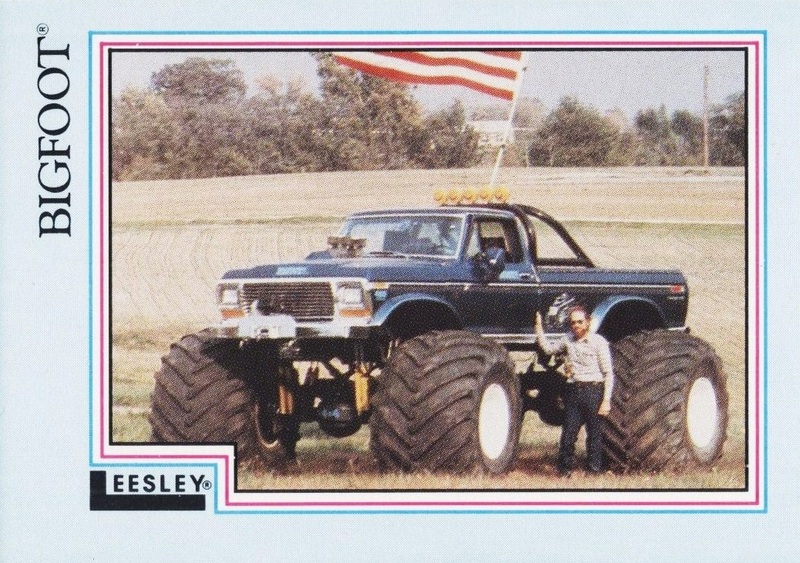 And the car cards...this is, by far, the BEST part of this set. 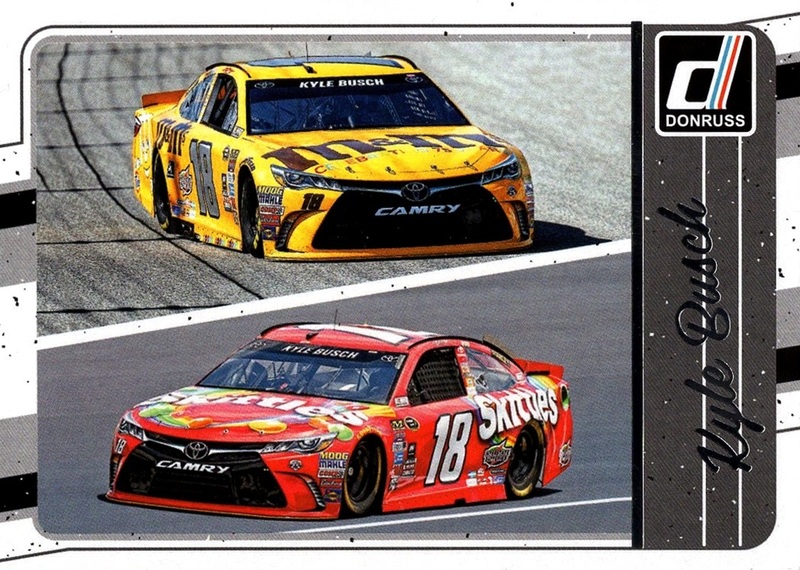 Not only do we get 21 car cards, they each show TWO cars! Most show the regular scheme and a special paint scheme, some show two special paint schemes, as this card does. (by the way, this was my first card from the set). Quite a few of the cards feature the Throwback cars from Darlington. 39 of the 40 cars in the race ran Throwbacks- it sure would have been nice if we got to see all of them. 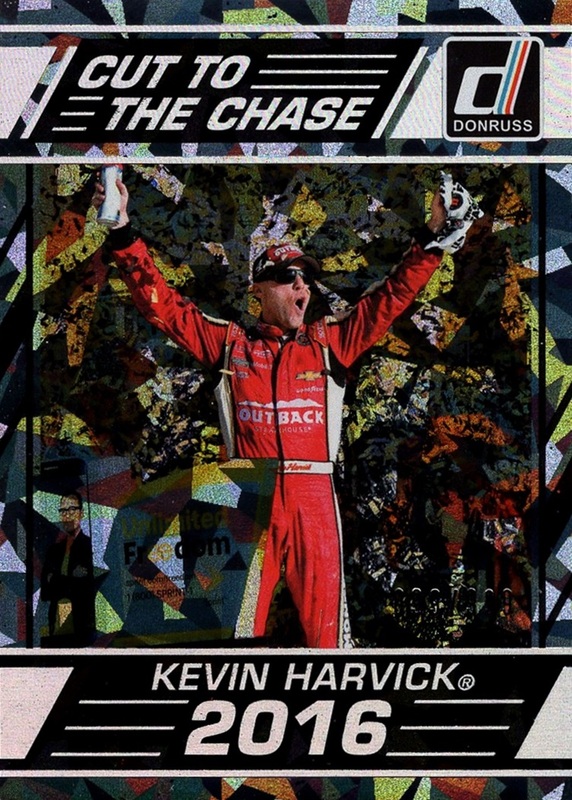 But this is the most car cards we've gotten in years. 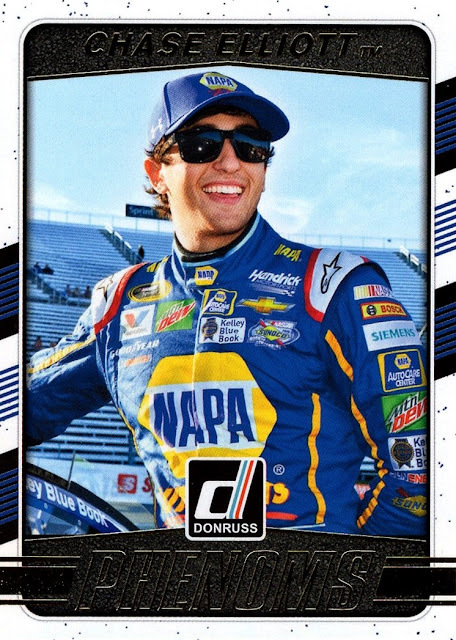 Discounting the 2011 set, the one time Press Pass actually got it right, you'd have to go back to the late 1990s to get this many car cards. Seriously. Expect a post dedicated to the car cards alone at some point. They are so good I'll probably post all of them together. The backs of the car cards are the only ones that are not color coded. They are all gray. 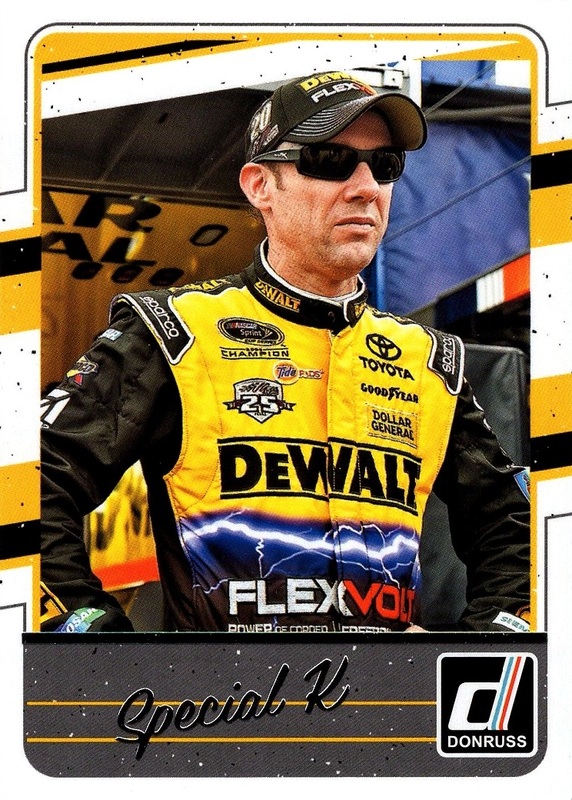 The Pit Crew subset, which is also horizontal, and shows cars, has team color card backs. Here is the Race Kings subset, which comprises cards #1-27 of the set, including the Race Queen card for Danica, Card #7, which I did not get in my box. They feature the painted look like the various Kings inserts are known for...except this time they are base cards, of course. Rated Rookies take up Cards #28-36, although most of the drivers in this subset have cards already. I got one base and one Green, and I am showing the latter. A good Green to get- Byron is a surefire superstar, and if we had a real points system, would have won the Truck championship last year as he won 7 races, and dominated the season. He is one of four drivers to have a Rated Rookie subset card and a base card. 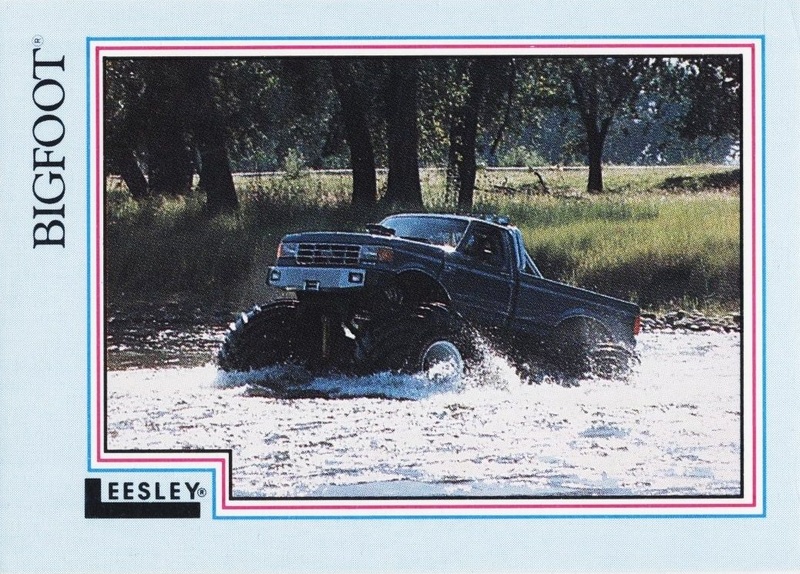 Note that the border shows tires- but treaded tires. NASCAR has used slicks almost exclusively since 1971, but they do have treaded tires for Eldora and the road course races. The card numbers on back are also in a design reminiscent of tires. 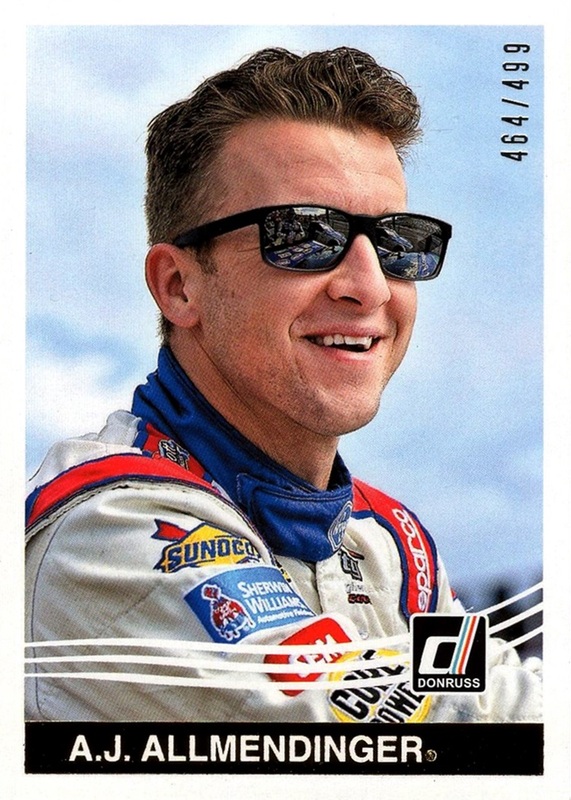 The 1984 subset is cards #137-184, and here I have chosen to show a Gold parallel, of AJ Allmendinger. The Golds are the most common parallel, I got 4 in my box. The gold foil scans as black, but trust me- the SN and the bar his name is printed on is gold foil. This subset falls a little flat to me. 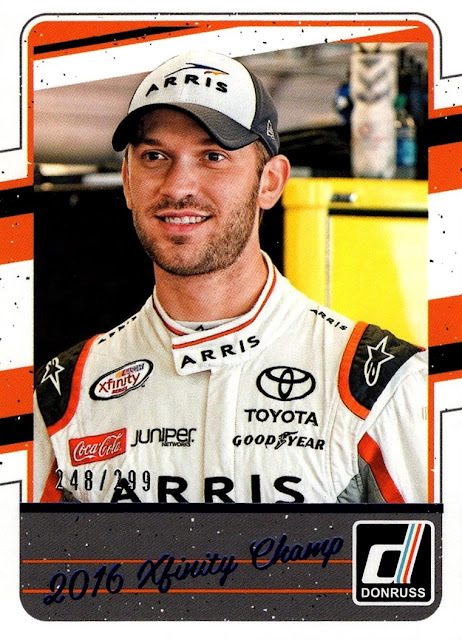 They aren't bad, by any means, but it would have been so much better if instead of the current drivers, we got actual photos from 1984, which predates NASCAR getting cards on a regular basis. There are some legends in this section of the set, but I don't have them so I don't know if they include photos from 1984. I know there are a couple of drivers who retired in the 1960s in the subset. 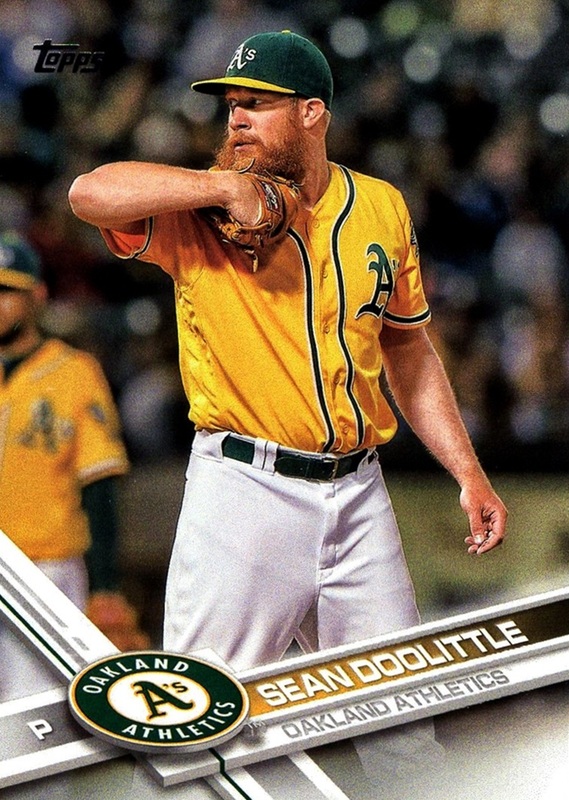 The Nicknames subset finishes off the checklist with cards #185-189, although some of the nicknames are kind of a stretch. 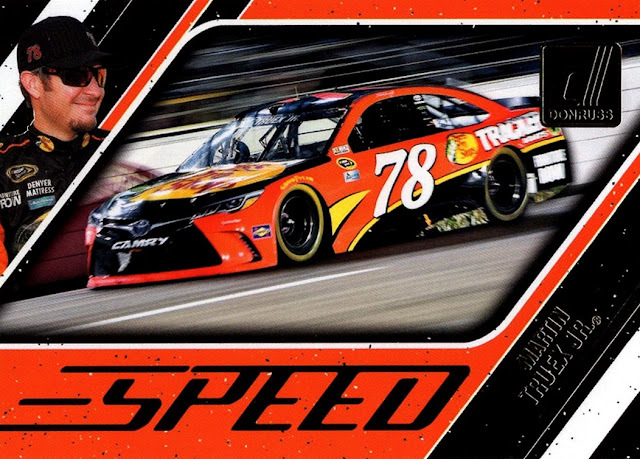 This is a Blue parallel of Daniel Suarez, denoting his Xfinity title last year. It uses the same photo as his base card. Despite being the second easiest parallel to find based on serial numbering, I only pulled one blue from my box, but two Greens, which have 100 examples less produced. Since green is my favorite color I am happy by that. There are also variation cards. I could do without these, mainly because they share the same number but are totally different otherwise-different photo, different text on the card back, and a nickname on the front. These are basically no different from the nicknames subset but instead of being part of the base set they just have the same number as the base card- stupid. 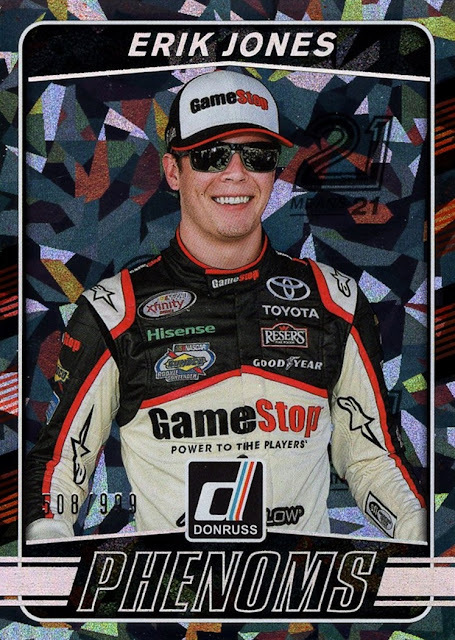 I pulled one from my box, and it was Kenseth. 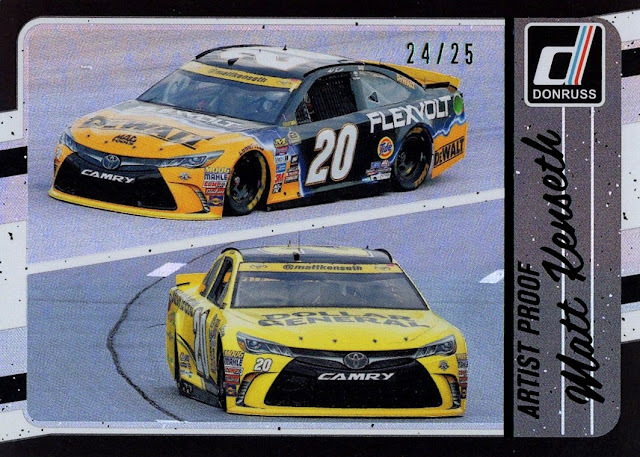 Interestingly, the base Kenseth card came from the same pack. There are several parallels I didn't pull, but I did manage to pull an Artist Proof card, which has only 25 copies produced, making it the rarest non-printing plate parallel in the set. It features a black theme, with black text, black border, etc. The card is holofoil. 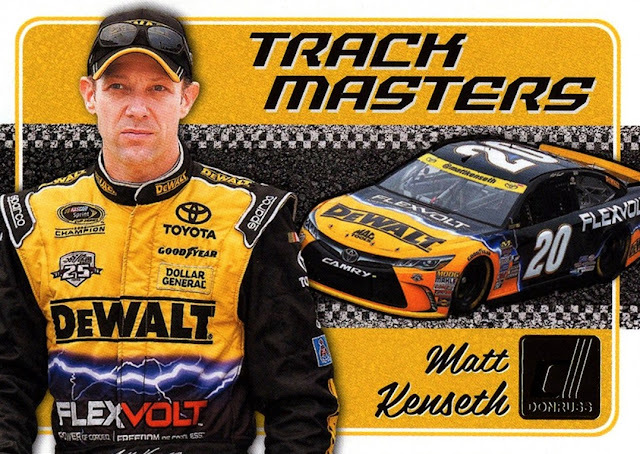 Another Kenseth. It doesn't really show in the scan but the card is refractor-like in hand. It's a nice card. Now, that covers the base set. But there are a lot of inserts, and all of them have parallels. The relics and autographs have gold and black foil parallels, and the standard inserts all have Cracked Ice parallels which are all numbered to 999 copies, I wasn't able to pull all of them, and in fact the Pole Position insert, I pulled ONLY a Cracked Ice, no standard. The Cracked Ice look much better in hand than they do in scans. Here are, without further blathering, all the standard inserts I got. None of them yielded more than one card per set. The inserts all feature gold foil on the standard version and holofoil on the Cracked Ice versions. The Call to the Hall set is the only one that includes photography from the 2017 season. Everything else reflects 2016, which makes sense when you consider that the set came out the week the 2017 season started. Now, each box promises one autograph and two relics, and I got exactly that. My autograph came out of my first first pack, and is my first and currently only card of third generation driver Todd Gilliland. 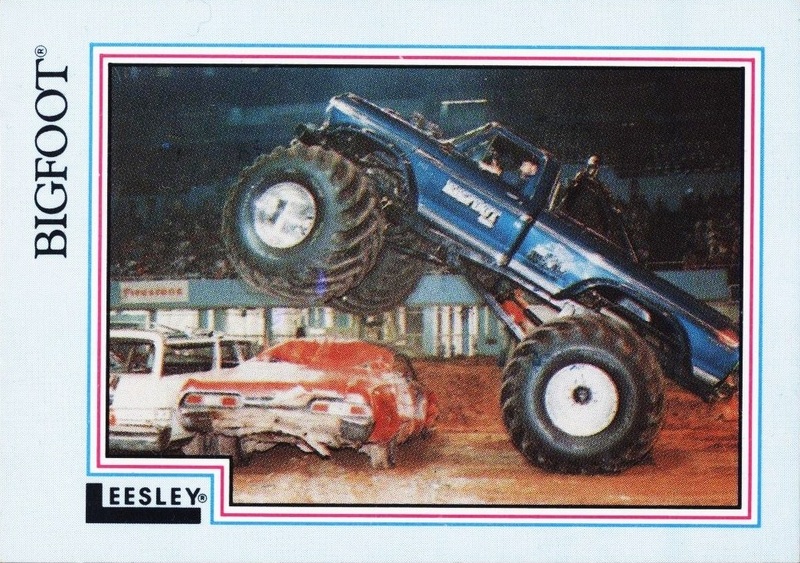 Interestingly, the Rubber Relics set includes more than one card for some drivers, who had more than one standard sponsor. 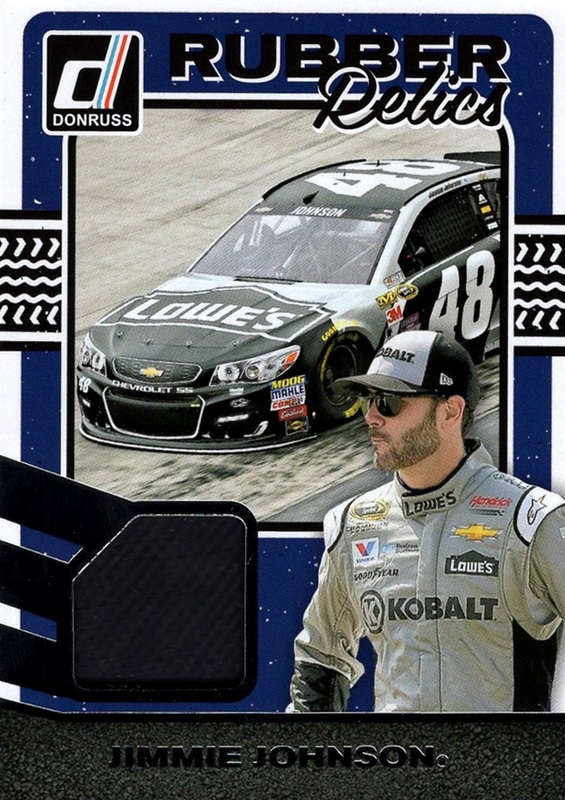 Jimmie Johnson is one of them- this card is for his alternate, Kobalt car. The back mentions a specific race but it's unclear if the tire piece used comes from that race or if they just chose to highlight that race. I suspect it may actually be the race the tire is from, because for Johnson it highlights a race he finished 16th in- nothing special for the multi-race winner and 2016 Champion. 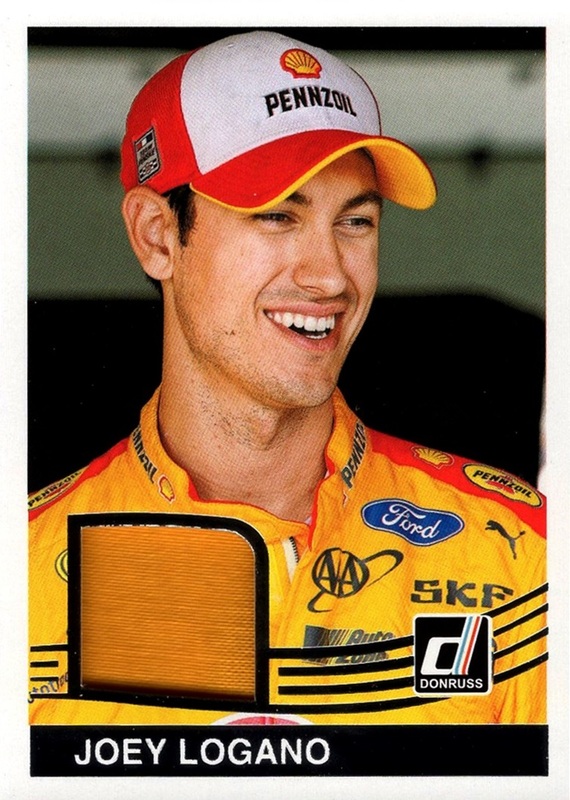 The Logano card, part of the 1984 Retro Relics insert, does not say what the material is but it feels like firesuit. I really wish Panini would tell you what it is they are putting on the cards. 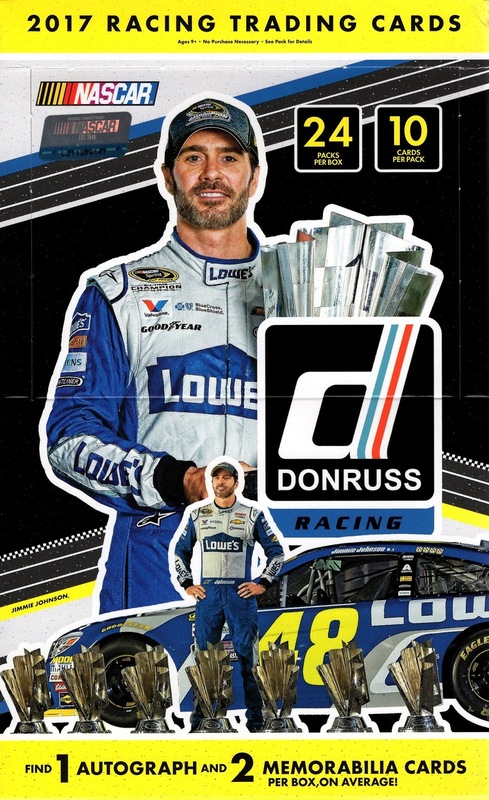 With NASCAR it's easier to figure out what the material is- there's no mistaking tire or sheet metal, for example- than for the other sports, which feature multiple options that use the same basic material, there's no real way to know, unless you get a patch and can match it to the jersey photo. Overall, this is a GREAT set, and a worthy flagship. It's not perfect, but I will say it's Panini's best effort so far. I completed the non-SP base cards from my box, with many duplicates to spare, but I still want to pick up a blaster to see if I can get some of the short prints or maybe a parallel. 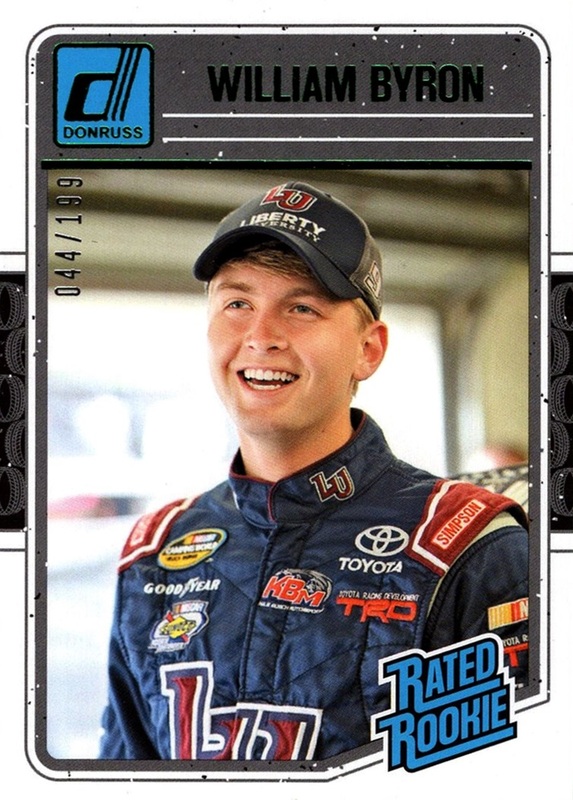 Five drivers made their cardboard debut in this set: Todd Gilliland, Alon Day, Julia Landauer, Matt Tifft and Noah Gragson. 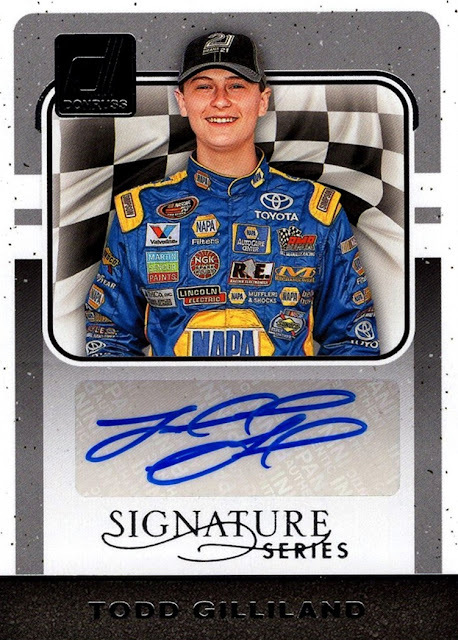 The latter four appear only in the Signatures series, while Gilliland appears in the Rated Rookie subset. I added 8 new people to my collection, which is a very high number for a NASCAR box. I don't know what the record is, but this may be it, not counting when I first started collecting and everyone was new, of course. New to me were: Gilliland, Byron, Kate Dallenbach, John Hunter Nemechek, Cameron Hayley, Daniel Hemric, Christopher Bell and Ben Kennedy. Thanks to my mom for giving me the box as a surprise gift! Lost and Found: Since 2007!